I have been looking on the forum for a bit. Decided to join to contribute and learn more. I recently acquired a 2000 road star 1600 with 40k miles for $1600. It needed brake work, and a little electrical work from the previous owner adding red led lights that kept shorting out and blowing a fuse. I took the bike home, replaced the brake fluid and bled the brakes. Worked beautifully after that. Cleaned up the wiring and made a dedicated circuit for the leds. The bike ran decent, but rich and had much less get up and go than I expected it to have. I did a compression test and had 168 psi in both cylinders with no leaking. I decided to blow out the air filter and that didn’t help. I took the carb out to inspect it and the air jet under the diaphragm looked awful. So did the air jet in the air box side of the carb. I took everything apart to clean and blow out. Diaphragms were good and the jets in the bottom of the carb were in great shape. After reassembly, the bike seems to have much more power and picks up speed way better than before. I do have a small issue on warm up now where the bike wants to hesitate and almost die when I give it a really quick twist of the throttle. I think I may need to adjust the accelerator pump to send more fuel. It’s such a strong runner now and I have to relearn the bike because now it picks speed up so quick that I am hitting 60 before I know it. from Richardson, TX. Surf the archives, ask questions, and enjoy your R*. Be sure to check the thread on what newbies need to check. You'll probably find it in Bike Talk. I have went through the list. Well I’ve read through it. Thank you for the tip. These bikes don’t respond well to quick throttle blips, so your issue sounds normal. Did you record the number sizes of your jets as well as the type of needle you have and where the clip was? That will help folks be able to help you. like shores said the roadie just doesnt seem to like real fast blips of the throttle. the 09 and up FI ones might do better but surely not the carbed bikes. You have a nice looking bike. For 1600 bucks, I'd say, you did get a good deal! form Oregon. Blips, while sounding cool, will sometimes become coughs on these tractors. Sounds like you are unafraid to explore and find out what makes your bike tick! You will fit right in. My first R/S was a '00. I learned so much modding that scooter. It's a real hotrod. I still enjoy punishing H/D riders on the street & the backroads of N/E Georgia. I also have an '04 long-distance scooter. It's pretty-much stock (BAK & pipes). I was checking the throttle response when I discovered it. Sounds like it might not be a problem after reading the responses. I still might mess with the adjustment on the accelerator pump to see what it does. I also need to find a way to check my rpm. After it warms up, it seems ok, I’m just worries I’m not above 900 rpm since I have read that it becomes an oil pressure issue. Do you guys think 168 psi is decent cylinder pressure? I don’t remember what the recommended range is for cylinder pressure. I forgot to add, I didn’t check the sizes of the carb components. It was re-jetted by dreyer motorsports at the same time the previous owner had the short shots installed. He gave me the work receipt with the original pipes. I doubt the work ticket had the specs on the components they added though. I didn’t keep the paper. I just remember the ticket price was like $380. Representing Scorpion Gulch, Arizona. You can roll on the throttle fast, just don't snap it open. This is antiquated technology (V-Twin) you are dealing with. Back in the day, folks were not concerned with a little spit and sputter here and there. Mine will do the same thing. from Conway, SC. Great deal for $1600. You should take your carb apart as suggested and see what size jets are in the carb as well as the neddle groove position. Then, add that to your profile so it will make it easier for folks here to help you with any issues you may have. Have fun, ride safe and be safe. Thanks for all of the welcomes. 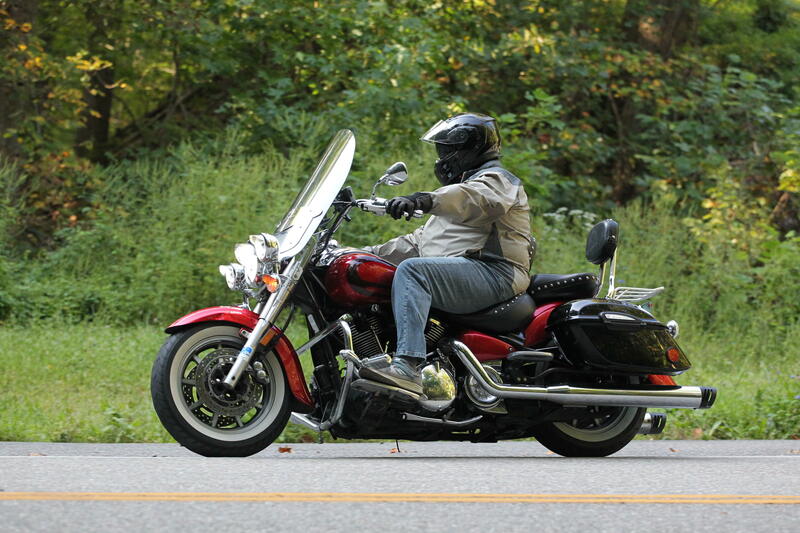 I am assuming that I will have the bike up for the fall and winter. Would you guys recommend draining carb and fuel stabilizer in the tank or adding fuel stabilizer and running it into the carb? Full tank with stabilizer throughout system. Don’t drain.